Salem Witch Hunt | Blame is the name of the game. Witch-burning has been with us a very long time. 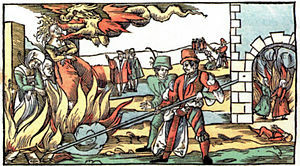 Today it’s a bit more metaphoric than literal, but accusations and “witch burning” remain very much a part of “human nature”, whether we participate or just watch. What lies at the root of the finger-pointing? Who are you escorting to the witch hunt? Wherever bullying occurs, the people who are aware of it and don’t object or intervene may believe that they are being neutral. In reality, they are actually helping the bully. Fear that they, too, will be subjected to mistreatment is one reason why bystanders look the other way when someone else is being targeted. A “culture of fear” develops easily, affecting everyone in an organization. People become intimidated from raising concerns, voicing opinions, sharing ideas, and afraid to be seen as “stepping out of line” while the more brazen personalities have their way without being questioned. Do we want this kind of tyrannical atmosphere in our community? Just how much oppression or pressure to conform is acceptable? When you see corruption being rewarded and honesty becoming a self-sacrifice, you may know that your society is doomed. YouTube: Jeffrey Watts explains “Divide and Conquer” tactics. While standing up for yourself is the right thing to do, toxic people simply don’t believe you have any right to refuse their mistreatment and they will set out to “punish” you for having any opinions that differ from theirs.